Montenegro Lines is the naval company that connects Montenegro to Italy with a regular service all over the year. 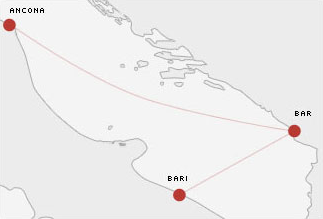 The fleet is made of ships "Sveti Stefan I" and "Sveti Stefan II" connecting the italian ports of Bari and Ancona to the port of Bar in Montenegro. Bar is crucially located over the traffic route to Budapest and Belgrado.